School’s out and it’s time to plan activities for the littles ones they won’t be bored to tears at home. If you are still looking for stuff to do, Wildlife Reserves Singapore have it all planned out for you across their three parks at the Singapore Zoo, Jurong Bird Park and River Safari. At the Singapore Zoo, the focus will be on dragons and mythologies, including a collaboration with HBO for the hit series, Game of Thrones while at River Safari, there’s an Escape Room theme, crafted by experts. At the Jurong Bird Park, penguins are the highlights for the holiday. More details are available below on what’s going on at each of the three parks. 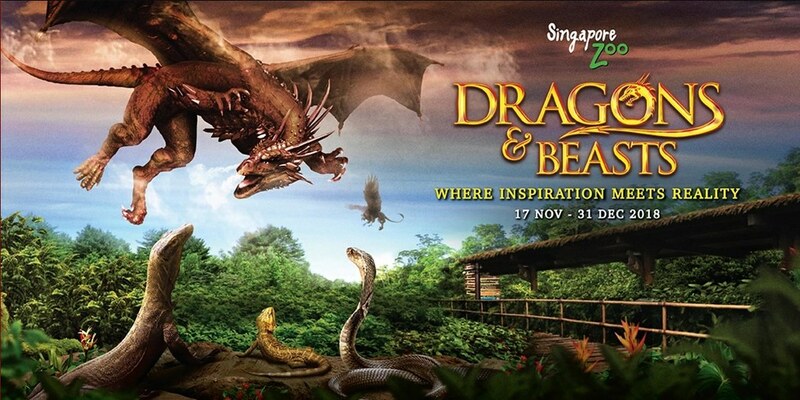 The flying reptiles of legend and other mythical beasts have descended upon Singapore Zoo. Not to plunder and destroy, but to awe and inspire. 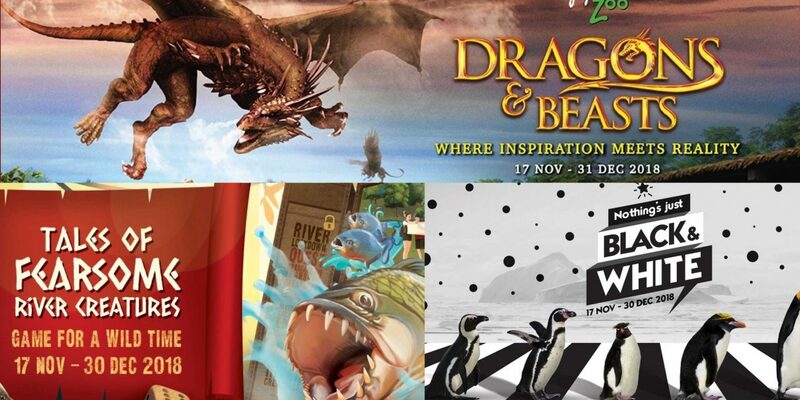 Enter the Valley of Myths and come face-to-snout with 17 creatures from fantasy and folklore like the Unicorn, Phoenix and of course, Dragons from 17 Nov – 31 Dec 2018. How could the legend of the one-eyed giant, the Cyclops, have originated from a modern living animal? Embark on the Creature Researcher Trail to find out how fantastical creatures were inspired by discoveries of modern animals, their appearance and the amazing abilities. See the legendary beasts come alive with animatronic movements and soundscapes, then uncover their real-life connections by visiting the animals that inspired them. Record your research findings in your complimentary trail map to redeem an exclusive prize. Which animal can match the Basilisk’s ability to kill in a single glance? Take on the “Who inspired who?” challenges at the game booths to discover how the unbelievable powers of the mythical beasts were influenced by equally amazing adaptations of living animals. Complete all three challenges to redeem an exclusive collectible pin. After basking in the glory of the larger-than-life dragons, don’t forget that real-life dragons do exist – meet the friendly Bearded Dragons at the Singapore Zoo during their interactive sessions. The mythical beast-themed activities happen weekends of 17 November to 31 December 2018, and on Christmas Day. Apart from fire-breathing dragons, Singapore Zoo will host some icy visitors from beyond the wall. In collaboration with HBO Asia, Singapore Zoo will for the first time ever, display a 3D replica of Viserion, the Night King’s Ice Dragon from the hit HBO series Game of Thrones. Mark your calendars as the Night King himself and his White Walkers will be making special appearances on 17, 18, 24 and 25 November 2018. Between 17 November to 31 December 2018, local residents also enjoy greater savings online – receive 45% off second admission to Singapore Zoo with every paying adult. More details are available on the official website. River Safari has been taken over by fearsome creatures, both big and small. Joining forces with Lockdown Singapore -Singapore’s leading Escape Game provider – River Safari will be transformed into a giant board game ruled by these fearsome river creatures; brave adventurers must save themselves, and you win a Pin of Honour when the quest is completed. the river banks and discover fun and fascinating facts during the feeding sessions for the Giant River Otter, Red-bellied Piranha and Electric Eel. their target training. Try to spot River Safari’s animal icon, Canola the manatee too. Grab a snake-themed donut or bread to recharge before you continue the adventure to escape from the fearsome creatures. Do also remember to snap a photo with Canola, the park’s manatee mascot, and take home a huggable plushie. Sign up for a new Friends of Wildlife membership (individual or family) with the promo code FOWDB18 and enjoy a 10% discount and an exclusive collectible pin. This promotion is valid from 17 Nov – 31 December 2018 and while stocks last. Local residents can save up to 15% when they purchase River Safari admission tickets online too. Visitors can hop on the daily Mandai Shuttle or Mandai Express service from the heartlands to reach River Safari. Discover interesting nuggets of information on these aquatic birds; chat with the park’s friendly penguin keepers to find out why penguins are black and white, and seize the opportunity to feed penguins by hand. Guests can catch the tuxedoed cuties excitedly chasing after bubbles as part of their enrichment, and win a collectible penguin pin when you complete games. Bring the whole family to enjoy an evening under the stars, as Jurong Bird Park swings its gates open at dusk for a one-night-only movie screening of Happy Feet. Or, opt to spend a night with our penguins through the park’s Sleep with the Penguins Family Camp, where young guests can learn all about penguins in greater detail from a guide, and drift off to sleep next to their exhibit, while watching these flightless birds ‘fly’ in the water. End your visit to the park by snapping a photo with the park’s mascot, and take home a customised penguin-themed bag or grab a penguin plushie. Treat the family to the park’s kid-friendly Christmas menu of pumpkin soup and meatballs, alongside a pop of cocktail jello. Fancy visiting Jurong Bird Park more than once in a year? Guests can now sign up for a one-year membership at the price of a one-day full priced ticket. Be a Friend of Bird Park and enjoy complimentary tram rides on weekdays and 20% discount off food and beverage and retail purchases. Sign up for a membership from 17 Nov to 31 Dec and take home an exclusive penguin collectible pin. Local residents enjoy up to 15% savings on admission tickets online. More details are available via the official website. In a special partnership with Wildlife Reserves Singapore, we will be giving out attraction tickets and plushies from each of the three parks during our weekly Monday giveaways! Follow us on our Facebook and Instagram so you don’t miss them! NextWhich Dyson Airwrap styler set should you get this Christmas? This is nice place to visit for kids in the singapore. I like zoo and bird park . There would be lot happiness at this place.